New research published in the Annals of Medicine looks into the effects of age on sleeping patterns. 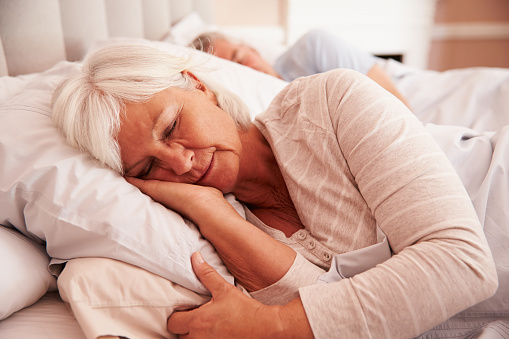 The study suggests that the elderly community may sleep less, but they report better quality sleep, including feeling more awake during the day. Getting adequate sleep is known to play a critical role in general health and also in many other medical conditions. While it is understood that it has an effect on one’s health, the changes in sleeping patterns amongst various genders and age groups is poorly understood. For the study, researchers from the University of Lausanne, Switzerland evaluated 6,733 subjects between the ages of 35 and 75; they excluded individuals who reported any sleep disorders. Participants were asked to complete questionnaires, which subjectively evaluated their quality of sleep. Each participant was given a polysomnography—a type of sleep study that examines brain waves, oxygen levels, eye movement, heart rate, and breathing. Researchers were then able to determine both the physical aspects of sleep patterns, as well as how individuals interpret their quality of sleep. The team discovered that aging was associated with preference for early mornings. Older adults slept earlier and woke up earlier. Researchers also found that women had an easier time falling asleep compared to men. However, sleep efficiency among both men and women diminished as they aged. More so, aging was associated with spending less time sleeping and less time complaining about lack of sleep. This is particularly interesting since older participants were more restless during their sleep. However, they reported better sleep quality and higher functioning during the day. Luca, G., et al., “Age and gender variations of sleep in subjects without sleep disorders,” Annals of Medicine 2015, doi: 10.3109/07853890.2015.1074271. Taylor & Francis, “Dream of feeling less tired? The trick comes with age,” ScienceDaily web site, August 17, 2015; www.sciencedaily.com/releases/2015/08/150817085621.htm.